Revive sensitive skin the gentle way with this exquisitely formulated powder exfoliant that provides maximum results with minimum irritation. Dual action micronized Adzuki Rice and Bamboo Powder gingerly remove dry, dehydrated, devitalized skin while Colloidal Oatmeal soothes and calm irritation. 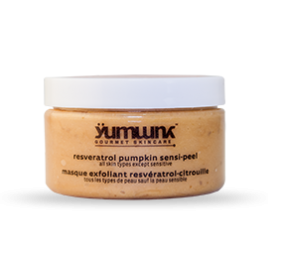 For normal/all, sensitives, mature skin. Experience nature. Yum Butter Volcanic scrub contains pumice harvested from a rich volcanic source that gently exfoliates and deep cleans without stripping. 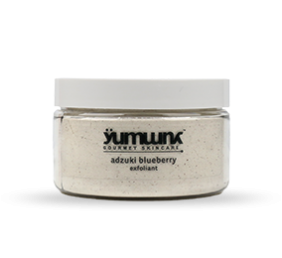 Exotic Kukui Nut containing Vitamins A, E, F, Linoic and Linolenic Acids fruit enzymes encourage cellular turnover and soft skin. For normal, oily/combination and mature skin. 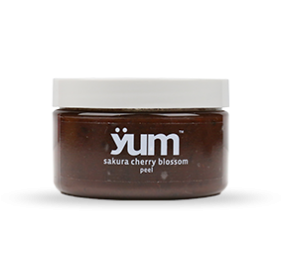 Yum Cherry Blossoms Sakura Peel comes from an exquisite flowers that symbolize the ‘beauty in nature’. This precious flower holds within its petals a powerful nectar that promotes collagen formation while inhibiting uneven skin tone. The Sakura Cherry Blossom Peel is a sensory, AHA treatment that encourages cellular respiration while removing devitalized skin cells. 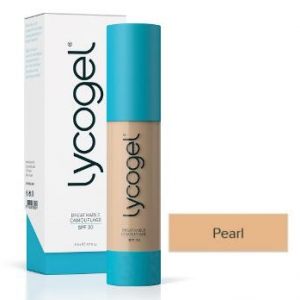 For hyperpigmented, mature, oily/combination skin.